For those of you that are just tuning in for the first time, welcome to #AuthorSpotlight. Each Wednesday I interview a different author. For the most part they’re romance authors, but I’ve featured authors from many sub genres. #AuthorSpotlight is a great opportunity for you to meet new to you authors, and read an excerpt from their work. It can also be a wonderful place to learn more about some of your favourite authors. 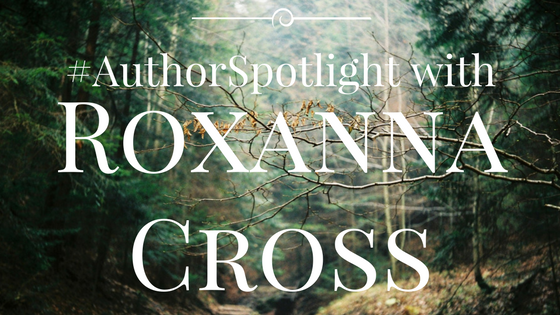 This week I’d like to introduce you to fellow eXtasy Books author Roxanna Cross. 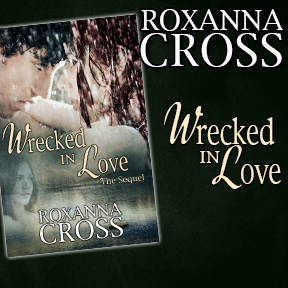 I met Roxanna a few months ago when I hosted my release party for My Mistletoe Master, back in December. She graciously volunteered her time that evening. She’s a wonderful author, and a generous person, I’m sure you’ll enjoy getting to know her. I am a mother of three beautiful teenage girls, the wife of a hermit who understands my quirky way of living in two worlds, and a daughter of parents whom have given me the greatest gift of all, a bright imagination along with the knowledge that nothing is impossible if you set your mind to it. Being a writer, a dreamer, a drifter gives me an outlet to calm the voices in my head. 2. Can you tell us a little bit about your latest release? And what readers can expect when they open one of your books? I suppose my when readers crack open one of my books they should strap in for the ride and see where the journey takes them. 3. What are your future writing goals? 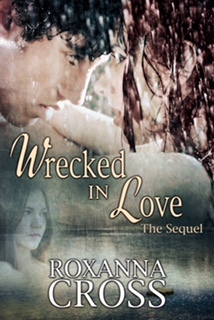 What are your plans now that Wrecked in Love the sequel has been released? To keep on writing and get back to my translating projects, which I’ve neglected, because I didn’t have the level of concentration needed to turn in the project with the level of quality expected due to ongoing migraines I’ve been battling with. Plus, I need to finish Wrecked in Love the Final Chapter. Also, I submitted a summer short for the series Extasy Books will be releasing later this year, well as it turned out I couldn’t fit it all in the word count we needed to respect so expect a Vol. 2. But, first I need to get my health back on track. As mentioned for years, I’ve been plagued with skull numbing migraines. Which I’ve been receiving many treatments for, now I’ve underwent surgery and hope to say good-bye to the migraines for good. I’m undertaking the road to recovery one day at a time. Oh, so many I will try to limit myself. Lucy Maud Montgomery – Anne of Green Gables is still a favorite of mine. Jane Austen I have read and re-read her books. Shakespeare I have no words to say I much he inspired me and inspires me still. Stephen King I still get chills every time I pick up a copy of The Shinning and I just loved his views On Writing. J.R.R. Tolkien I can get lost over and over again, in the battle for middle earth or go off on a quest against an ancient dragon any time. Kathleen Woodwiss it’s so easy to fall in love with her roguish men and her attention to the historical details are bang on. And for a while I lived in a land of magic and bards and talking white horses, yes Mercedes Lackey’s Valdemar series lives on my bookshelf a bit battered from overuse, but otherwise all books remain in one piece. My first love of vampires I attribute to Anne Rice’s Interview with a Vampire. A love I kept on developing with Laurel K. Hamilton Anita Blake’s series. Dean Koontz took a classic like Frankenstein and completely made its own with his series. Nora Robert such a versatile writer jumping from contemporary romance to cold hands of death– love both her styles and the suspense the twists she introduces, a true inspiration for any aspiring writer. How can I explain this…my writing is mostly driven by flashes I get, like a movie in my head, and the voices come to life buzzing at different frequencies. Sometimes a dream will trigger it, maybe a lyric from a song or a passage from a book. I can never pin point it. I just know the voices buzz and I need to write to calm the noise inside. Now we’ve already talked about books earlier, if you get me started on films we could be here awhile, same could be said about music as my choice are eclectic. My playlist is anywhere from the piano classics like Chopin Nocture No9 and Debussy Clair de Lune. Then on we go to classic rock:Pink Floyd, The Doors, The Rolling Stones, The Beatles, The Eagles… Moving towards rock anything from: AC/CD, Aerosmith, BonJovi, Metallica, Disturbed, Pat Benatar, Heart etc. Feel like going down to some country roots no problem we have some Johnny Cash, Garth Brooks, Reba, Luke Bryan, Blake Shelton, Carrie Underwood and more. Want a bit of pop flare, got some of that too, Eminem, Maroon 5, Meghan Trainor, Pink and Taylor Swift – a must on my list! My alternative/punk vibe rocks on with some Hedley, Rise Against, Three Days Grace, Nirvana, Radiohead, Smashing Pumpkin, Red Hot Chili Peppers, Cold Play, U2, R.E.M., Linkin Park and so much more we’d be here till the cows come home if I’d list them all. In some way I’m sure some lyric, some note, inspired a flash or a turn of a phrase somewhere in one of my books and I am grateful for the inspiration these great artist provided. The editing process is grueling, yet necessary. The line-by-line editing is what to me is most difficult. Taking apart the work, reconstructing it if you will it can make me go bonkers and at some point, it gets so intense my eyes see double that’s when I step away from the screen and say it’s time for another creative project like massage candle making or knitting or crochet. Josephine Herveaux attempts to quiet the ghostly voice in her head, but her cousin Geraldine won’t let up. The closer she gets to the man she’s yearned for as long as she can remember, the more intense her cousin’s voice grows. And she’s not the only ghost who comes for a visit. OCD Dom Derek Owens stands at the pinnacle of everything he’s built his life on. In one instant he crosses that line and he feels he should be punished for it. All because Josephine is back in town and his control lies in fragments at this feet. Josephine and Derek fight to quiet Geraldine’s ghost, but she’s not ready to let go of the past—yet. And she’s not the only one might have a say in this union. A gripping story that’ll leave you hanging. Crave the answers.